Pan grilled tortilla encrusted Tilapia filet, served over rice pilaf and one side. Topped with pico de gallo and diced avocado garnish. Lemon wedges on the side. Battered and deep fried, lightly spiced whitefish and imitation crab. Cakes served over rice pilaf and topped with creamy mayo/honey/chipotle sauce. Comes with two sides, lemon/tomato garnish and lemon wedges. A sauté of sliced red and green peppers, sliced onions, sliced zucchini and nine large shrimp with a hint of oregano and our own green chile sauce. Topped with melted Monterrey Jack cheese and served with a choice of two sides, lime wedge, lemon wedge and regular garnish. Six plump shrimp stuffed with imitation crab and whitefish wrapped in bacon and topped with a blend of green chiles and Monterrey jack cheese. Served with arroz, three flour tortillas, sides of red or green chile, and chile con queso. Soft flour tortillas filled with a lightly battered and deep fried piece of cod, sautéed bell pepper, pico de gallo, shredded lettuce, and Monterrey Jack cheese. Comes with a side of tangy raspberry vinaigrette and served with a choice of red or green chile and two sides. Includes tostadas, salsa and sopaipillas. Served with choice of two sides – refritos, whole beans, arroz, papitas or Mexican corn and, red or green chile. Onions upon request. A large sopaipilla shell filled with chicken that has been marinated with our own salsa. Topped with lettuce, pico de gallo, guacamole, sour cream and Jack cheese. Served with two sides and choice of chile on side. Choose three entrées and two tasty side dishes of traditional Mexican favorites. 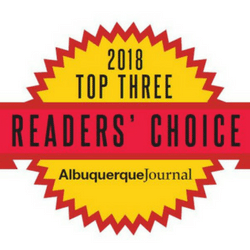 A succulent six ounce Choice Top Sirloin steak accompanied by two cheese enchiladas, choice of red or green chile and two sides with regular garnish. For the heartier appetite, upgrade to a 10 oz. sirloin for just $3.50 more. A succulent, 10 ounce Choice Top Sirloin, char-grilled to order and served with French fries, guacamole, garnish and sopaipillas. Your choice of two rolled flour or corn tortillas overflowing with spicy steak strips, topped with a golden touch of melted Jack cheese. Served with our distinctive avocado garden salad and refritos. A succulent,10 ounce Choice Top Sirloin, char-grilled to order and served with choice of two sides. Chile con queso and sopaipillas on the side. Juicy 1/2 lb beef patty cooked medium-well to well, topped with green chile and melted cheddar cheese and served with choice of two sides and sopaipillas. Juicy 1/2 lb beef patty cooked medium-well to well, on a flour tortilla with melted cheese, guacamole and side of chile beans. Prepared in the traditional way with a large, full green chile pod, filled with cheese and fried in egg batter. Covered with your choice of chile and garnish and served with two sides. A generous portion of spicy pork simmered in red chile or chicken in green chile, combined with a delicate flavored sweet corn masa. Topped with chile and melted cheese and served with your choice of two sides. A crisp fried burrito filled with choice of beef, chicken or carne adovada, topped with guacamole and sour cream. Served with two sides and garnish. Beef or chicken and melted cheese rolled in a corn tortilla, fried and topped with sour cream and guacamole. Served with two sides and chile on the side. Not for Gringos! A hearty sautéed blend of seasoned beef, Mexican chorizo, green peppers and onions make this the top enchilada.Topped with choice of chile and served with two sides and garnish. Large, thin, crisp flour tortilla stuffed with choice of beef or chicken, melted cheese, guacamole, sour cream, lettuce and tomato. Served with choice of two sides and chile on the side. Two blue corn tortillas, prepared either soft or crisp fried. One filled with beef and refritos; the other, guacamole. Both are topped with melted cheese, sour cream and garnish. Served with arroz, refritos and a side of chile con queso. Red or green chile. The "Big" Burrito! A 9" flour tortilla filled with refritos, taco meat, carne adovada, red or green chile, lettuce, tomatoes and cheese. Smothered with red or green chile and served with two sides. FEEDS UP TO FOUR PEOPLE! 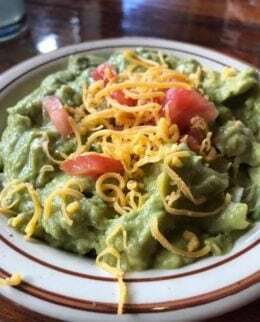 A special sampling of the good food of Papa's, to be shared with a friend.Two guacamole salads and a large sizzling platter with a chicken enchilada, blue corn beef enchilada, chalupa verde, chile relleno, chimichanga, tamale and flauta. Chile con queso, red and green chile on the side. Served with tostadas and salsa, arroz, refritos and sopaipillas. No Substitutions Please.